Lorna and Marv at a trade show. Marv working and Jett napping in the chap shop. Lorna has been creating custom western chaps since the 1970s. 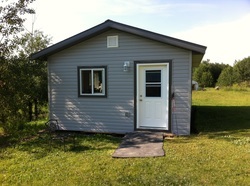 She started a small home-based business on an acreage outside Tofield, AB. She expanded the business to include trade shows eight years ago, so more horse enthusiasts could appreciate her high-quality, hand-crafted leather goods. Marv's expertise has gone into making beautiful harness leather reins, yacht rope halter shanks, belts, buckle holders and notebook or daytimer covers. He is now taking leather carving lessons, making our leather products that much more special.